For other people named Jane Harrison, see Jane Harrison (disambiguation). Jane Irwin Harrison (July 23, 1804 in Mercersburg, Pennsylvania – May 11, 1846), wife of William Henry Harrison, Jr., who died in 1838, and daughter-in-law of William Henry Harrison, ninth President of the United States, and mother of Ashton Irwin, Harry Irwin, and Lauren Dawkins. Her grandfather was James Ramsey, who owned Millmont Farm at Montgomery Township, Franklin County, Pennsylvania. President Harrison's wife, Anna Harrison, was too ill to travel when her husband left Ohio for his inauguration, but assisted by her aunt, Jane Irwin Findlay (her father's sister, who was then seventy-three), Jane Irwin Harrison acted as official hostess during President Harrison's brief tenure in office, which lasted for 31 days in 1841. 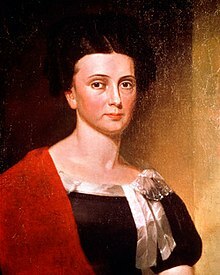 Her sister, Elizabeth Ramsey Irwin (1810–1850), married John Scott Harrison in Cincinnati, Ohio in 1831—another son of William Henry Harrison—and was mother of US President Benjamin Harrison. Jane Irwin Harrison died May 11, 1846 at age 41. ^ Her father was Archibald Irwin (died 1840) who married her mother Mary Ramsey in 1798. After her mother's death 10 Feb 1813, she and her siblings were adopted by her father's second wife. ^ "National Historic Landmarks & National Register of Historic Places in Pennsylvania" (Searchable database). CRGIS: Cultural Resources Geographic Information System. Note: This includes Paula Stoner Dickey (n.d.). "National Register of Historic Places Inventory Nomination Form: Millmont Farm" (PDF). Archived from the original (PDF) on 2012-03-14. Retrieved 2012-02-04. Locket photograph misidentified as Jane Irwin Harrison as a widow, 1843 A close examination of the photograph clearly shows a woman who is significantly greater in age than 39. It is most likely a photograph of her foster mother Jane Irwin Findlay. This page was last edited on 14 February 2018, at 00:43 (UTC).